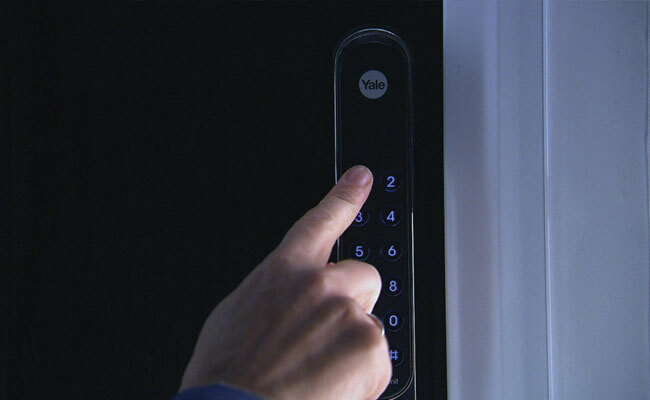 Yale Digital Smart Locks enable you to lock your doors with the tap of a button. You can lock and unlock your door by using the dedicated Yale Security app, dedicated key fob or by typing in a unique code. You can even give a temporary code to allow friends, relatives or cleaners in while you're away. PVCu doors are the most common form of replacement doors and feature a multipoint lock running the length of the door. A multipoint lock often locks in three places and features rollers to ensure a tight, weatherproof seal, making for a highly efficient and more secure locking solution. PVCu doors are often made of a white plastic resin, but are available in other finishes. Composite doors also feature a multipoint lock, and are often finished in a woodgrain effect, to give them a more natural timber look. A traditional timber door usually features a nightlatch, which has a single locking point that is often round-edged and spring loaded. Timber doors can be fabricated from softwood or hardwood, and can include glazed panels and a moulded fascia. Finished in either a natural glaze or a coloured paint, a timber door can be easily identified by the distinctive sound of knocking on wood. 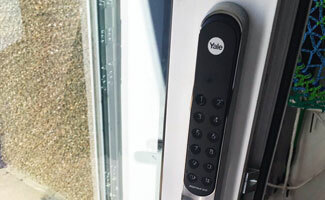 The Yale Keyfree Connected Smart Lock is compatible with PVCu and Composite doors and gives you freedom to secure your home without the need for a key. It's simple to use, you now have complete control on how you unlock your door. There's no need to worry if your children arrive home early, or if you're stuck at work with friends on your doorstep. You control who and when people have access to your home. For example, you can set a PIN code that works for 24 hours for a family member or your cleaning person. You choose how you want to open your door. PIN Code, Remote Fob and even from your smartphone when connected to a smart home system. It is also easy to add and remove users if you need to. Feeling safe and secure is a must for any home owner. In addition to a tamper alarm and incorrect PIN Code feature the smart lock is approved by the Police Secured by Designed scheme. Don't worry if the electricity goes down as the smart lock is powered by 4 AA batteries. It will even warn you when the batteries are running low. Complete your smart home system. 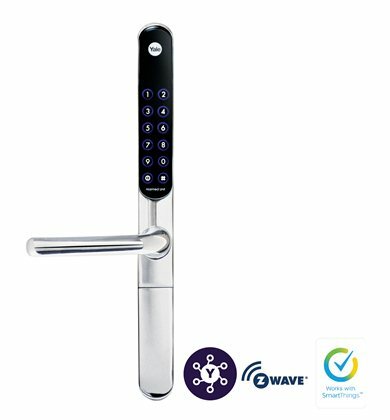 The Keyfree Connected smart lock can connect to leading smart home systems when the appropriate module is fitted. It also connects to the Yale Smartphone Alarm and CCTV systems when you use the Yale module. The Yale Keyless Digital Smart Lock is compatible with timber doors. A unique 4-10 digit PIN code can be used to unlock your door. You choose how you want to open your door, Pin code, key card, key tag / fob and smartphone operated. What is your door made of? 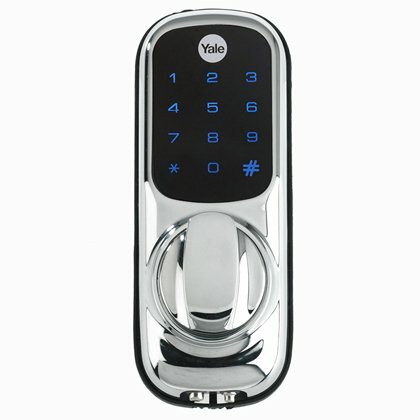 Interested In The Yale Smart Security Range?